The Sea Hagg is a craft distillery salutes the rich history of the alchemy of distillation with a fresh, new mind-set. 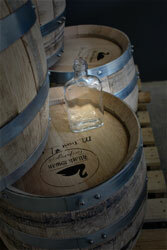 We produce high quality, small batch artisan spirits fermented, distilled, aged and bottled on site. The Sea Hagg rum recipes are inspired by the local history of rum consumption and production and produced from sugarcane molasses grown and made in the USA. Sea Hagg fruit brandies and eau-de-vie will be use fruits sourced from local growers. To produce the highest quality spirits made from the most flavorful and most local ingredients we can find. We produce classic products and innovative, new spirits that the Seacoast can be proud of. It is the Sea Hagg Distillery’s goal to become a leader in micro-distillation and “Drink Local” movement in New Hampshire and beyond. What makes Sea Hagg products special? Using select ingredients we hand craft in small batches. From the co-op and farms to our bottle (or farm to flask), our process is tenderly managed by the distiller. 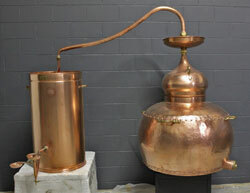 Traditional copper alembic still allows flavors to remain in the spirit….rather than stripping them out. We keep as many of the natural flavors that the original molasses or fruit contributed and then produce a product that has pleasing attributes for mixing or sipping with a little ice on their own. Our distillations are the “un-vodkas”. They all start as a crystal clear distillate that is full of robust flavors and just get better with time. Each spirit is aged in new, hand-made barrels that are custom toasted and charred to our specifications and aged in New Hampshire Seacoast air. We bottle by hand and wax dip to seal. The Sea Hagg label is fun – and not a pirate. Our products are proudly made in New Hampshire. 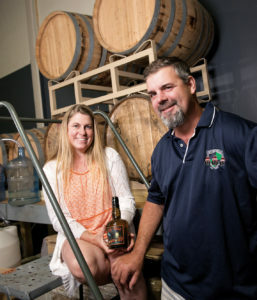 The Sea Hagg Distillery is a woman-owned and -operated company. 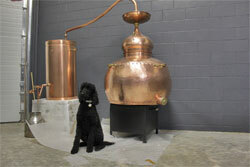 We have a distillery dog. The Seacoast Rugby club loves us. How was Sea Hagg Distillery born? It was a combination of a number of different events that lead to The Sea Hagg Distillery. It started with a long love of the ocean and rum and a crossroads in a career path. Sitting on a beach in the Caribbean contemplating the meaning of life with a rum punch, good company, and beautiful ocean was the inspiration. The original idea was to import rum from the Caribbean, blend it, and bottle it in New Hampshire. The concept evolved as further investigation into the production of rum, the history of rum in New Hampshire, and the microdistillery movement in the United States was explored. We decide to make our own rum instead of searching for one to import. Owning a microdistillery is the perfect combination of jobs. There is alchemy and art, sales and marketing, restaurants and eating/drinking, and history and lore. The time to start the new venture was now. I quit my job and spent almost a year researching the microdistillery business and the distilling craft. I read, researched, attended distilling classes, toured microdistilleries, and hired consultants to help educate me on the successes and pitfalls of the industry. That may have been the easy part. There are lots of hurdles to clear to become a licensed distilled spirits plant, including town approval, a federal license, a state license, federal and state label approvals, distribution, etc… The Sea Hagg Distillery has cleared the big hurdles and now on to making and selling spirits the seacoast will love.